Street Level Studio built the PPRC with Drupal, which allowed us the flexibility of a content management system, while still being able to implement a completely custom design. Drupal’s ability to create custom content types made it possible to utilize a wide range of content and resources on the site. At the same time, using a content management system was important to ensure that once the site was built content would be easy to update and wouldn’t require highly specialized web development training to manage. Making sure the site was accessible on a wide variety of devices was very important so that customers and information-seekers could interact at their point of interest on the device of their choice. With a responsive-design layout in mind, Street Level Studio used Bootstrap, the most popular responsive website framework, to build the site compatible with mobile and desktop devices alike. The homepage acts as an overview page, showing the breadth of content available, while still allowing the customer to find content related to their specific market segment. Street Level Studio structured the website subpages around the segments and then further subdivided pages into specific content category types so that customers can easily find the information they are looking for. Detailed tracking of resource downloads and video views were required for all items on the PPRC. A custom tracking tag naming convention was developed that would allow detailed information about each download and video view to be passed to Google Analytics. This information plays an important role as CSA and Street Level Studio determine what types of new content should be created and added to the PPRC. In addition, external online ads are directed to individual resource landing pages on the PPRC. These ads also have custom tracking tags that allow us to measure and report on an each ad’s performance, and to identify each ad as a traffic source when creating reports in Google Analytics. CSA requested that some of the more “premium” resources on the site require the user to register before they would be able to download or view the content. Once registered, the user would have unlimited access to all of the premium resources on the PPRC. Street Level Studio built a gating system that required the user to complete a brief registration form before having access to these resources. A newsletter archive was added to the site to allow visitors to access past articles and to make sure old but still relevant content could always be found. 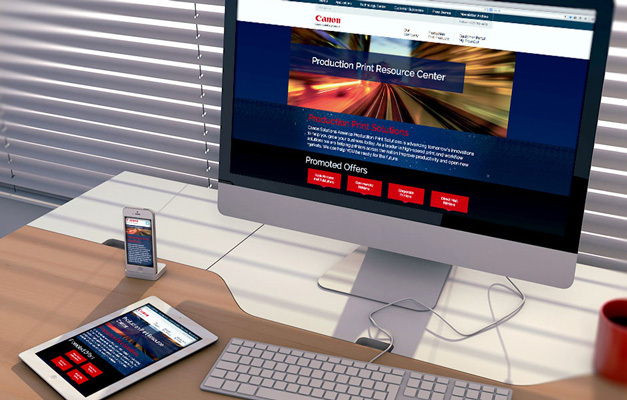 A newsletter sign-up form was added that connects directly to CSA’s email marketing and deployment system, Marketo, allowing website visitors to sign up to receive Canon Solutions America Production Print Solutions’ monthly enewsletter Digital Printing Insider. See the Production Print Resource Center.